The District’s Earned Income Tax Credit (EITC), based on the federal EITC, assists residents who work but have low earnings through a refundable income tax credit that puts money back in the pockets of those who need it most. For the 2015 tax year, about 66,890 DC tax filers claimed a total of $63.6 million, with an average tax credit of $950. Thanks to expanded eligibility and credit levels for workers without children in the home, over 10,000 more DC working families and individuals claimed the DC EITC in 2015 than in 2014.
Who is Eligible for the EITC and How Does It Work? Since the DC Earned Income Tax Credit is based on the federal EITC, it is helpful to understand how the federal EITC works. The federal EITC is available to eligible working households based on income, the number of qualifying children in the household, and the household’s filing status. These criteria also impact the actual EITC benefit a household receives. 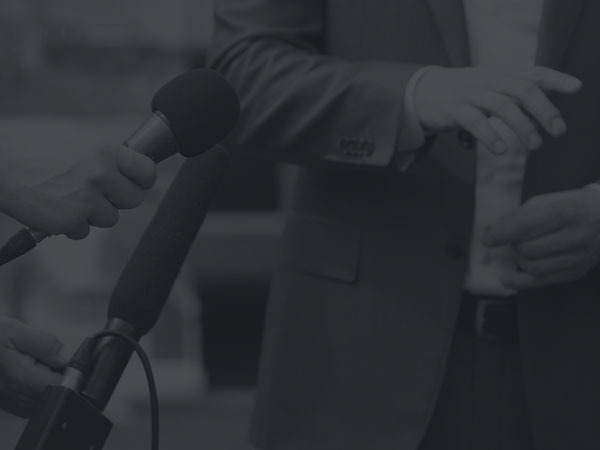 The EITC is designed to reward and incentivize work. The credit amount grows with each additional dollar of income earned for those with very low earnings, reaches the maximum credit and levels off, and then decreases slowly to zero as earnings reach the income limit (Figure 1). To be eligible for the EITC, workers must possess valid Social Security numbers for themselves and their children, and have either United States citizenship or permission to work legally in the United States. Any investment income the worker has must be less than $3,400 in 2016. 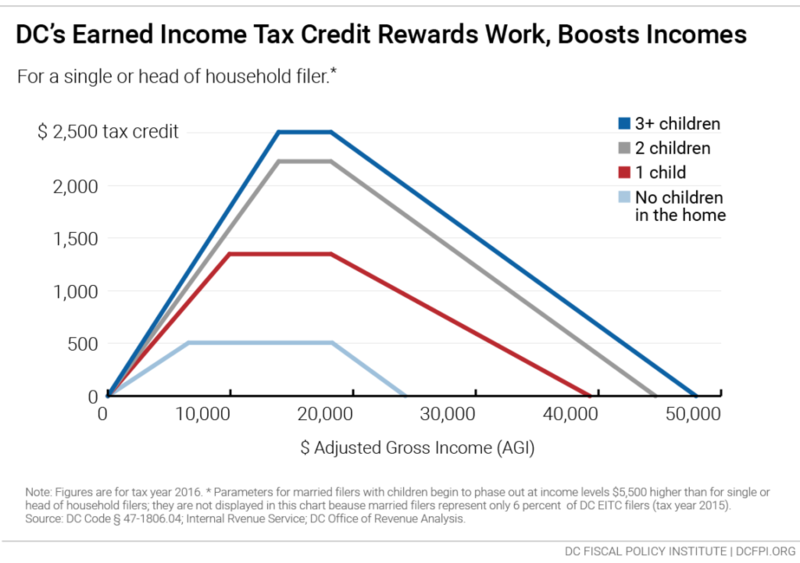 For working families with children, the DC EITC is equal to 40 percent of the federal EITC credit. For adults without children in the home,[i] the DC EITC is 100 percent of the federal EITC. As discussed below, the larger credit percentage for workers without children reflects the fact that the federal credit for these workers is very low and much smaller than for families. Like the federal EITC, the DC EITC is a refundable tax credit. This means that it not only reduces taxes owed, dollar for dollar, but if the EITC exceeds the taxes owed, then the household receives the balance as a refund. While the federal EITC provides a great deal of help for households with children, it provides limited assistance for adults without children in the home. The maximum federal EITC for workers without children is much smaller and the income limits are more restrictive. For example, in 2016, the maximum federal EITC for a single person without children is only $500, and workers without children must have incomes below only $14,880 to receive the federal EITC. To address the limitations of the federal credit, the DC Council acted to expand the DC EITC for workers without children in the home in 2014,[iv] following recommendations of the DC Tax Revision Commission. 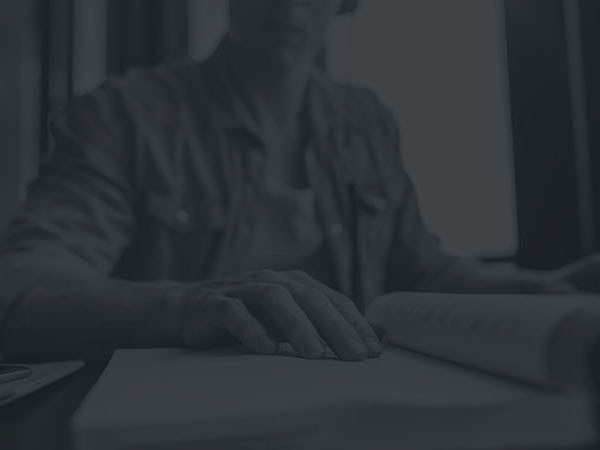 [v] Those changes went into effect in tax year 2015. 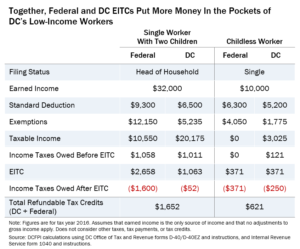 The expanded DC EITC provides a special supplement to the federal EITC for workers without children in two ways (Figure 2). The value of the DC EITC for workers without children in the home is 100 percent of the federal credit (versus 40 percent for workers with children.) This means that the DC EITC matches dollar-for-dollar the tax credit that workers without children claim in their federal return. Workers without children who have incomes up to $18,290 can receive the maximum DC EITC, versus up to $8,270 for the federal EITC. While the federal EITC ends when income exceeds $14,880, DC residents earning up to $24,250 can receive some level of tax credit. 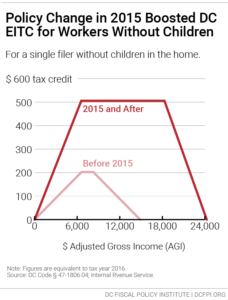 As a result, more workers without children can receive some amount of the DC credit. After the expansion of the DC EITC for workers without children, 10,300 more workers claimed credit than the previous year (Figure 3). In total, the total amount of DC EITC claimed by workers grew by $8.3 million. Comparisons of 2014 and 2015 data on DC and federal EITC filers strongly suggest that the expansion was responsible for more DC workers, especially workers without children, claiming the DC EITC. The number of tax filers claiming the DC EITC increased 18 percent between 2014 and 2015, whereas the number of filers who claimed the federal EITC (which did not expand) fell by 1 percent (Table 2). [vi] This suggests that more DC workers claimed the DC EITC because of the policy change. Because a worker’s EITC grows with each additional dollar of earnings until it reaches the maximum value, the EITC creates an incentive for workers earning the lowest wages to increase their work hours, and for those who are not working to enter the labor force. [ii] All years in this brief refer to tax years unless otherwise noted. [iii] Calculation of taxes owed assumes that the worker files as head of household, that earnings are the worker’s only source of income and that the worker’s adjusted gross income is the same as his or her earnings, and that the worker takes the standard deduction. 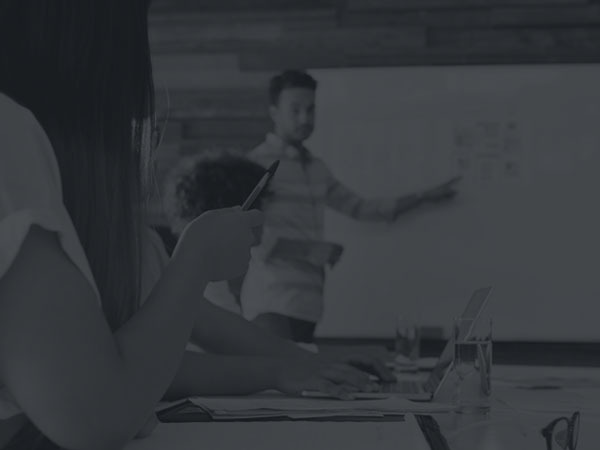 This hypothetical worker would likely also be eligible for other tax credits, such as the child tax credit and the child and dependent care tax credit, which are not considered here. [iv] DC Law 20-155, Fiscal Year 2015 Budget Support Act of 2014. 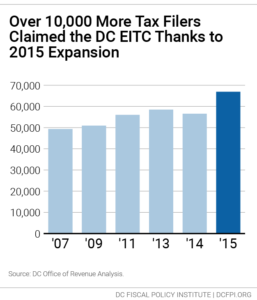 [vi] Prior to the DC EITC expansion, the number of DC EITC filers tracked closely with the number of federal EITC filers. Over tax years 2007, 2009, 2011, 2013, and 2014, the maximum difference between the two was 4 percent, in 2013. [vii] For unmarried adults with dependent children, filing as head of household usually has tax advantages over filing as single. Yet 21 percent of DC EITC filers with children were single filers. 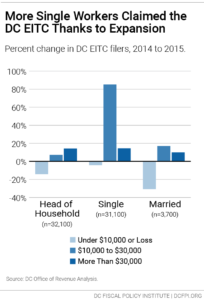 [viii] Between 2014 and 2015, the number of single DC EITC filers with incomes between $10,000 and $30,000 grew by over 9,000 filers, or 85 percent. (This figure exceeds the total increase in single DC EITC filers because the number of filers in other income groups fell by around 400 filers). [xi] Raj Chetty, John N. Friedman, and Jonah Rockoff, “New Evidence on the Long-Term Impacts of Tax Credits,” Statistics of Income Paper Series, November 2011. Available at http://www.irs.gov/pub/irs-soi/11rpchettyfriedmanrockoff.pdf.